Costa Rica is famous for its rich diversity of birds and wildlife. This diversity creates a unique balance between the powerful inner journey and the rich surroundings. PachaMama is located in the dry sub tropical forest of Nicoya peninsula. Now that the land is healed from its past as a cattle farm and the forest is lush again, the birds and wildlife have come back. This land is home to almost 300 different species of birds that fill the air with exotic sounds every morning as the forest awakens. 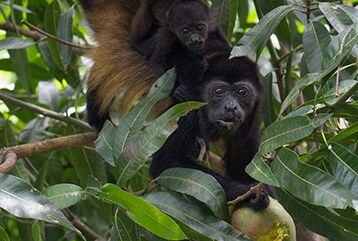 There are several families of Howler Monkeys certain to be seen and heard daily as they live among us in the trees. We have many other mammal friends who share this land with us: White-nosed Coatis, Nine-banded Armadillos, Hairy dwarf Porcupines, White-tailed Deer, Common Possums, Squirrels, Tayras, Agoutis, Kinkajous, Anteaters, Raccoons, Bats…. and if you are very lucky you might spot an Ocelot or a Jaguarundi wild cat. Being a passionate Wildlife photographer and naturalist, Tyohar periodically offers early morning bird tours and night wildlife tours for up to six people in each group. A few minutes drive from PachaMama is Ostional Wildlife Refuge Beach, the world’s most important nesting site for the Olive Ridley Sea Turtle which comes ashore in huge numbers every year to nest and lay their eggs. This phenomenon, known as ‘arribadas’, takes place almost every month, and lasts three days. Two months afterwards, thousands of small turtles will hatch from the eggs and run to the ocean. Truly an amazing sight to see. “This generation holds a tremendous responsibility; our mother is dying, for thousands of years we were worrying about the father, who is a better father? Allah? The Holy Ghost? Hashem? Ganesh? Shiva? And we forgot about our mother… Mother Earth. Mother Earth is wounded and depleted from all our selfish behavior for thousands of years. We need to change the structure of the way we are living on this planet, the way we are treating this womb that gave us this opportunity for life.